There are those who push boundaries and those who choose to ignore them altogether. The challenge: Create the highest-performing dual driver in-ear monitor ever. This was no easy task which is why we’ve employed two entirely different driver technologies, a class-leading 4-way synX crossover network, and A.R.C. anti-resonance technology to deliver the most performance possible. Every aspect of the Bravado was conceived, designed, and crafted to faithfully reproduce what the artist had intended. 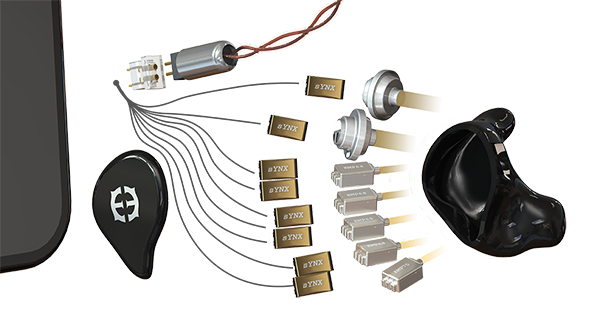 With the expertise of artist, musicians, and mix engineers, including GRAMMY Award winner, Sam Ash, we were able to understand firsthand what they require from in-ear monitors. Ultra-Wide Frequency Bandwidth: The Bravado produces a super-wide frequency range, offering listeners unparallel sound quality and details that bests even the most high-end headphones on the market. Every Bravado in-ear monitor includes a bespoke, handcrafted Ares II cable by Effect Audio. The Ares II boasts a proprietary blend of 26 AWG UPOCC Litz copper with ultra-flexible insulation for maximum signal speed transmission, performance, and ergonomics. Each cable is terminated in an ultra durable 3.5mm, 24k Oyaide gold plated right angle plug. Alternatively, for our audiophile clientele, we also offer 2.5 and 4.4 balanced terminations at no additional charge.